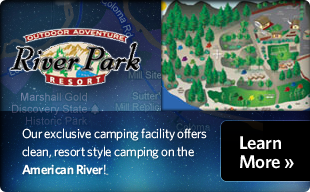 River Park Resort - Camping on the South Fork of the American River! Join us at Beyond Limits Adventures for the finest multi-day rafting trips in California. Our deluxe 12-acre rafting center provides our overnight and 2 day guests an exceptionally comfortable camping experience. Located riverside on the South Fork American River with fabulous views, beaches and shady places to relax, River Park Resort is a great place to host your group's raftingadventure. Welcome to Coloma, California "The Whitewater Capital" of the western US. This is where California's first gold was discovered in 1848 along the banks of the South Fork American River. Today you'll discover an incredible place for whitewater rafting! Our rafting center was built for the sole purpose of hosting the most deluxe 2 day rafting adventures possible. We have cabin tents which are furnished with comfortable beds and cots. Relax in a lawn chair overlooking the American River enjoying a cool beverage while our staff prepares a bountiful meal for you and your friends. Off river activities include swimming, tubing, campfire, hiking, mountain biking, fishing, gold panning... there is even a casino within a short drive from our camp! Our rafting center features hot showers, flush toilets, and sinks for your use, please bring your own towels and toiletries. Our group campsites are all river front and shaded by a quiet oak forest. Our beer garden features Sierra Nevada Brewing Company on tap and Modelo Especial on tap along with lots of cold bottled beer. We also serve local wines from the Coloma Valley and El Dorado County wine country. After rafting please visit one of the three wineries with a mile or so from our camp. This is a fun way to experience the rapids and wines of our unique area! River Park Resort's camp store carries a large selection of beverages, snacks, beer, soda and souvenir items, including t-shirts, hats, and photographs of you and your friends on the river! Our 2 day trips include camping with your own equipment. We also offer cabin tent accommodations as an upgrade. Each tent will sleep 2 adults (2 extra youths may sleep in the bunk beds). You may also bring your own tents to set up near your cabin tent for extra persons. Our cabin tents and yurt are located on a bluff overlooking the river. Bring your own sleeping bags and pillows. You may also rent tents and sleeping bags at our camp store. These upgraded outfitter cabin tents with foundations are set up for 2 adults and their gear. 1 double bed and 1 bunk bed are included, bring your own sleeping bags and pillows. Each tent can also accommodate 2 extra youths. You may reserve our cabin tents when you book your rafting trip online or call to verify availability. This deluxe bungalow tent provides the ultimate camping experience. It will hold up to 3 adults. Bring your own sleeping bags and pillows. The yurt can also accommodate 2 extra youths. You may reserve our Yurt when you book your rafting trip online or call to verify availability. The only equipment that is required to stay at our resort is your personal camping equipment (sleeping bag, tent, pad, and toiletries). We do not allow pets, but we can recommend boarding for your pet in our area. Things to bring on a 2 day trip: Towels, changes of clothes, Soap and toiletries, lawn chairs, sleeping bag, pillow, pad, tent (if needed), flashlight, sunscreen, swimsuit, sunglasses. Sleeping bags - $10.00 per stay. Incidentals for camping such as firewood, ice, flashlights, repellent, sunscreen, etc. may be purchased at our camp store. All-inclusive 2-day trips include lunch each day, dinner(Saturdays only) and breakfast. All meals are served buffet style. Our hearty bar-be-cue Dinner is served Saturday nights at our outdoor grill with plenty of sides and beverages. Hot Breakfast with eggs, biscuits and sausage - including coffee, tea, hot chocolate, fruit juice and ice water. Lunch - Chili and Vegetarian chili with salad, fresh fruit, cookies and beverage. 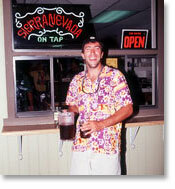 Beer and Wine may be purchased from our camp store anytime (normal business hours) during your stay. For optional meals (such as pre-trip breakfast on day 1) there are several fine restaurants located nearby within easy walking distance from our camp. During your 2-day or 1 day trip, you will be served meals at our upper dining area. Our riverfront common campfire area is for campfires only, no cooking is allowed at our resort. Please leave your stoves, grills and kitchen at home if you book a trip with us. There are plenty of good restaurants within walking distance of camp that serve dinner. Don't forget to bring your own sleeping bags, towels and pillows during your stay. We do not provide these items. We do not allow fires in camp except at our designated fire pit at the river . We do not allow fireworks. Smoking is not allowed in our tents, campsites or in public areas of our resort. If you do smoke, you must discard of the butts in your own metal can and take with you when you leave. Please recycle and put your trash in one of our waste bins located throughout camp. No loud music or generators are allowed in camp.